In Jerusalem, Isidora Binte Deogel watches as her father–a driven and talented alchemist–slowly poisons himself with his dangerous experiments. Shut out from his scholarship, Isidora struggles both with her exclusion and her dislike for the obsession that is driving her father to madness and death. Then a handsome, fair knight, Lucien de Griswold, arrives at their doorstep, obsessed with a desire to learn alchemy himself. Several years after Lucien’s return to England, Deogel’s dying wish is for Isidora to deliver his dangerous discoveries to his favorite apprentice. This request compels the young woman to travel to a new land and either betray her father or give the man she loves the key to his own destruction. Meanwhile, Isidora is pursued by the dangerous Kalle FitzMalheury, one of Deogel’s prior apprentices. Like Lucien, Kalle wants the key to the Philosopher’s Stone. Unlike Lucien, he wants to use it to obtain power rather than save lives. The unexpected arrival in East Ainsley of Isidora, her half-brother Faris, and the threatening Kalle interrupts Lucien’s betrothal–and his peace of mind. It also unsettles his assumption about marriage: can he really wed a woman while continuing his possibly heretical experiments? First, it is unlikely that, in 1202, Isidora and her brother could so easily locate Sir Lucien’s home in the middle of winter in England only three months after departing the Holy Land. That Kalle also arrives in short order only increases the implausibility. Second, the dialogue is opaque. One character says a few convoluted lines, and then the other “understands” their meaning and responds in an equally confusing fashion. Knighton makes the assumption that the reader can see into the characters’ heads, but in fact has not written them in a fashion that allows us to understand what conclusions they are drawing. This flaw is frustrating, for I found myself constantly going back to read previous paragraphs to untangle the thread of a scene, always without success. Third, Knighton and her characters rob Isidora of her agency. While this is an effective setup (Isidora is pushed aside by her father and fears being pushed aside by the man she loves as well), there is not a convincing turning point where she begins to take control of her life and the hero respects her choice. Instead, Isidora finds herself betrothed to Lucien without ever receiving a proposal, and is trundled about like a piece of baggage. There are far too many scenes of Lucien chiding Isidora for her behavior, or Lucien stomping off to “deal” with her. The transformation of his character–which is essential to complete the arc that Knighton establishes about Isidora always being pushed aside by her father–is not convincing. 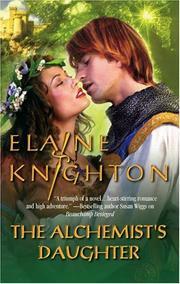 Finally, The Alchemist’s Daughter is crammed full of secondary characters and intrigues. Often, these characters are types or skeletons of characters. The cast includes an unnecessary fiancée for Lucien, a feisty younger sister, a castrated monk, a lovelorn mother and uncle, a conveniently discovered half-brother, and sidekicks for both hero and villain. The profusion of secondary characters distracts from the protagonists’ development. I wish there was more positive I could say about The Alchemist’s Daughter. I kept reading because I liked the book’s concept, but I did not get much out of it. Although it is neither disturbing nor offensive, I cannot recommend Knighton’s book.